Temporary shelter made from new straw bales and new bamboo poles. This autumn I was working on a straw bale house for a client and decided to play with bales myself. 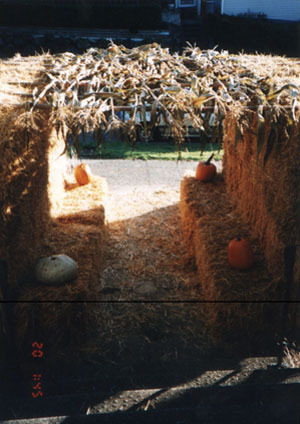 The whole sukkah is made of plant stalks: the straw bale walls, the bamboo rafters, and the corn stalk covering. The structure is a cube, made of stacked two-string bales, four courses tall. Since it was temporary, I did not bother to impale the bales with rebar or bamboo ties, and it stood up just fine under its own weight. We used one course of bales to form a bench along both sides. It was clear and cold this year, and everyone appreciated sitting on and leaning back against the insulating bales. They did a great job of breaking the wind and warming our tushes! Materials cost about $130 and construction took one day, plus an afternoon to get the bales. 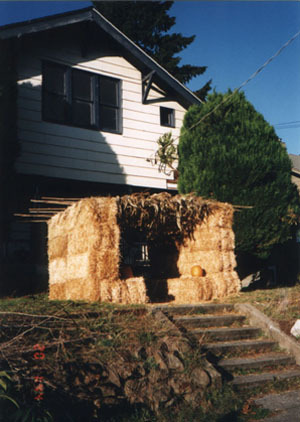 The sukkah was dismantled at the end of the holiday week and the bales were distributed to friends to cover their vegetable gardens against winter frost.